The Rear Cross-Traffic Alert system initiates whenever you put the SUV in reverse. It uses a couple of sensors located on the rear sides of the exterior. If a vehicle approaches from either the left or right side of the CX-5, you'll hear an audible alert and see visual warnings on the dash. To provide further assistance, the CX-5 has a clear rearview camera. Its feed is displayed onto the infotainment screen in the cabin automatically when you shift into reverse. 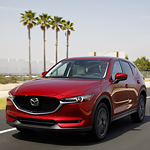 Stop by Ramsey Mazda to give these features a try. During your test drive through Urbandale, you'll quickly see how they can improve your driving experience.